DALLAS — Feb. 27, 2007 — Five years ago, Sharon Schafer Bennett suffered from migraines so severe that the headaches disrupted her life, kept her from seeking a job and interfered with participation in her children’s daily activities. Now, thanks to an innovative surgical technique performed by a UT Southwestern Medical Center plastic surgeon who helped pioneer the procedure, the frequency and intensity of Mrs. Bennett’s migraines have diminished dramatically — from two to three per week to an occasional one every few months. The technique — performed by a handful of plastic surgeons in the U.S. — includes using the anti-wrinkle drug Botox to pinpoint which of several specific muscles in the forehead, back of the head or temple areas may be serving as “trigger points” to compress, irritate or entrap nerves that could be causing the migraine. Because Botox temporarily paralyzes muscles, usually for about three months, it can be used as a “litmus test” or “marker” to see if headaches go away or become less intense while the Botox’s effects last, said Dr. Jeffrey Janis, assistant professor of plastic surgery. Plastic surgeon Dr. Jeffrey Janis marks a site that, using the anti-wrinkle drug Botox, pinpointed a muscle later removed to help relieve Sharon Schafer Bennett's severe migraines. If the Botox is successful in preventing migraines or lessening their severity, then surgery to remove the targeted muscle is likely to accomplish the same result, but on a more long-term and possibly permanent basis, he said. For Mrs. Bennett, the surgery proved to be life-altering. Dr. Janis said:“Many neurologists are using Botox to treat migraines, but they are making the injections in a ‘headband-like’ circle around the forehead, temple and skull. They are not looking at finding the specific location of the headache’s trigger point. While patients may get temporary relief, after the Botox wears off they will have to go back and get more injections or continue medications for migraines. 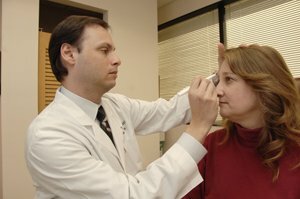 Dr. Janis began collaborating more than five years ago with Dr. Bahman Guyuron, a plastic surgeon at Case Western Reserve University and the first to explore using surgery to relieve migraines, following the revelation by several of his patients that their migraines had disappeared after they had cosmetic brow lifts. Dr. Janis has assisted his colleague by performing anatomical studies on cadavers to explore the nerves and pathways that might cause migraines. Together they have identified four specific trigger points and developed a treatment algorithm that includes using Botox prior to deciding whether to perform surgery. During the past several years, numerous peer-reviewed articles have been published in Plastic & Reconstructive Surgery detailing their research efforts and the researchers have presented the technique at professional meetings of plastic surgeons. Approximately 28 million Americans, 75 percent of those women, suffer from migraines, according to the National Institutes of Health. For employers, that translates into an estimated 157 million lost workdays annually. Dr. Janis only sees patients who have been diagnosed with recurring migraines by a neurologist and have tried other treatments that have failed. For additional information, call 214-645-2353. UT Southwestern Medical Center, one of the premier medical centers in the nation, integrates pioneering biomedical research with exceptional clinical care and education. Its more than 1,400 full-time faculty members — including four active Nobel Prize winners, more than any other medical school in the world — are responsible for groundbreaking medical advances and are committed to translating science-driven research quickly to new clinical treatments. UT Southwestern physicians provide medical care in 40 specialties to nearly 89,000 hospitalized patients and oversee 2.1 million outpatient visits a year.